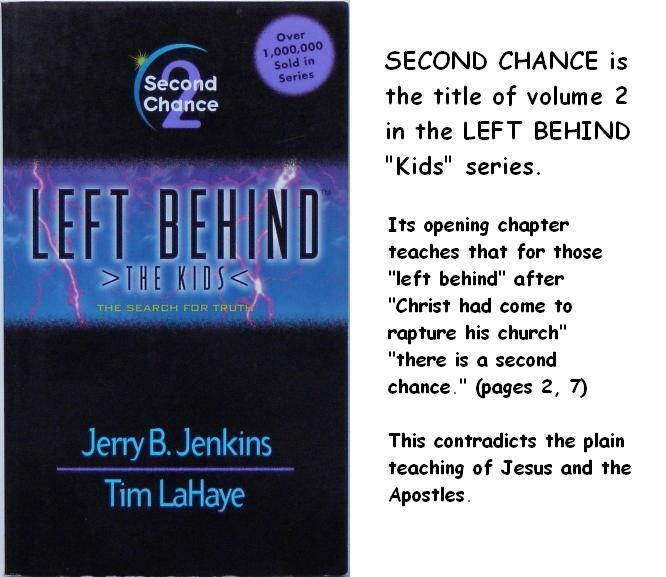 WILL UNBELIEVERS GET A 7-YEAR "SECOND CHANCE" AFTER THE RAPTURE? NOT ACCORDING TO THE BIBLE. Calvin, Luther and the other Reformers did not write anything to refute the idea that unbelievers would have a seven-year second chance after the Rapture, because they never heard of such an idea. It was not being taught by anyone. The idea that Christ would return twice  once invisibly to rapture believers, and again seven years later to destroy this wicked world at the end of a tribulation period  was a totally foreign concept. Luther and Calvin never encountered such a teaching, so they did not need to refute it. This teaching first surfaced in the modern church in the early 1800s  around the time when Joseph Smith produced the Book of Mormon  in the teachings of John Nelson Darby, a preacher of the British fellowship known as the Plymouth Brethren. The idea first gained popularity when C.I. Scofield incorporated Darby's teachings in the footnotes of his 1909 Scofield Reference Bible. The words of Jesus and Paul in the Bible itself are very clear. The key is to read them in their full context. The Apostle Paul's words, often quoted out of context in bits and pieces by Left Behind advocates, actually refute this teaching. In his first letter to the Thessalonians Paul tells what will happen when the Lord returns: the dead in Christ will rise, living Christians will be raptured, and unbelievers will face sudden destruction  not a seven-year reprieve. "For the Lord himself shall descend from heaven with a shout, with the voice of the archangel, and with the trump of God: and the dead in Christ shall rise first: Then we which are alive and remain shall be caught up together with them in the clouds, to meet the Lord in the air: and so shall we ever be with the Lord. Wherefore comfort one another with these words. But of the times and the seasons, brethren, ye have no need that I write unto you. For yourselves know perfectly that the day of the Lord so cometh as a thief in the night. For when they shall say, Peace and safety; then sudden destruction cometh upon them, as travail upon a woman with child; and they shall not escape." Paul here makes it very clear that Christ returns, dead Christians rise, living believers are raptured, and sudden destruction comes upon the unbelieving world. However, in the very next verse, the disciples asked the most obvious question about those who were to be left behind: "'Where, Lord?'" they asked. He replied, 'Where there is a dead body, there the vultures will gather.'" (Luke 17:37 NIV) So, Jesus indicated those left behind would be "dead" -- with the vultures consuming their dead bodies. How does anyone get from this that they would be 'left behind' to face a seven-year period to include the Antichrist's reign and the great tribulation? Only by ignoring the context. A plain reading of the whole discussion at Luke 17:22-37 in context leads to no other conclusion than that those left behind at the Flood, at the rain of fire and brimstone on Sodom, and at the return of Christ are all destroyed. The return of Christ would not be "like" the Flood and the destruction of Sodom, if those left behind were to remain alive for seven years. Jesus said his return would be like those earlier acts of God in which everyone left behind was left dead. In the parable of the wheat and the tares, Jesus said, "First collect the weeds and tie them in bundles to be burned; then gather the wheat." (Matt. 13:30) This is the opposite of the Left Behind story where the believers (wheat) are raptured first, and the weeds or tares are not burned until seven years later. Jesus' parables of the faithful and wise servant, the talents, the ten virgins, and the sheep and the goats (Matthew 24:45 through 25:46) all illustrate that he "will come at an hour when you do not expect him." (Matt. 24:44) The parables don't fit Tim LaHaye's story of those 'left behind' receiving a second chance. Each one of the parables shows faithful followers rewarded, and those who are found unfaithful thrown into "eternal punishment . . . where there will be weeping and gnashing of teeth." (Matt. 24:46, 51) Instead, Left Behind shows the unfaithful given a second chance over the next seven years. So, Jesus and Paul both show that the Lord returns, raptures the Church, and brings "sudden destruction" on the unbelievers  all at once, not in two stages over 7 years. Unbelievers don't get a seven-year "second chance." came right after the 69 weeks, not 2000 years later as an end-times tribulation as Left Behind teaches. "Christ confirmed the covenant with many during the last week..."
was a tribulation on "this people," the Jews, beginning when the Romans destroyed Jerusalem  not a 7-year period in the end times as Left Behind teaches. "'for then shall be great tribulation, such as had not been from the beginning of the world until now, no, nor ever shall be.' All this pertains still to the Jewish nation." a future leader like Left Behind's Nicolae Carpathia, but came to power when the Roman Empire, which was restraining it, got out of the way. The papacy and Islam are "the two horns of Antichrist." does not need to be rebuilt, with its priesthood and sacrifices, to fulfill prophecy. "He will make to cease the sacrifice and offering ... Christ ... offered himself up as a victim, then all the rites of the law came to a close." was fulfilled by the Romans at the desolation of Jerusalem. "But the abomination of which Daniel writes is that the Emperor Cajus, as history tells, had put his image in the temple at Jerusalem as an idol, for the people to worship, after everything there had been destroyed." MORE No 7-year "second chance"
for unbelievers after the Rapture. Christ is coming once, not twice as Left Behind claims.